Vaccinating your pet is a relatively inexpensive but very important way to protect his or her health. 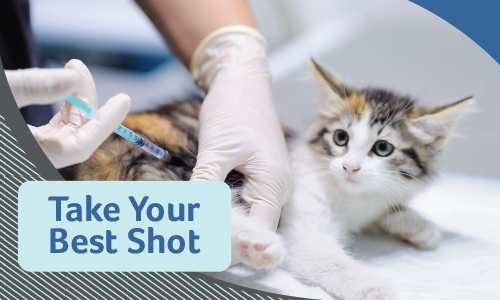 In addition to preventing many life-threatening illnesses, vaccinations can keep your pet and family safe from diseases prevalent in wildlife and those that can be passed to humans. Other important and highly suggested vaccinations include FeLV to protect cats against feline leukemia. We recommend this as a core vaccine for the first year of your cat’s life and then as a lifestyle vaccine thereafter. For dogs, bordetella and canine influenza shots are a must if they frequent dog parks, boarding kennels, or any place where they’re socializing with other canines. Your Glendale Animal Hospital veterinarian may also recommend leptospirosis and Lyme disease vaccinations depending on your dog’s lifestyle. It’s important to note that even pets who live primarily indoors should be vaccinated, as they can still be exposed to disease. We can advise you about which vaccinations are right for your pet—simply call us at 630-297-4709.